BOOHOO Had me at HELLO. This boohoo look is one of my absolute favourites. Simply because the clothes alone come to £26 together. You cannot beat that price for a online retailer outfit. Believe it or not, the trousers are the cheapest thing I'm wearing! I'm going full on 70s in this look. I feel like I should be at Woodstock. Paisley can be a bit of a hard one to rock I must admit. These trousers are pretty damn bold and won't be everyone's cup of tea. One of my fav fashion babes Tiger is a huge inspo for this look. I LOVE her blog, so if you're loving this look I suggest you go check her out! I recommend sticking to warmer colours such as orange and mustard to match with the print. since I've got some black boots on. This top is fabulous for ladies with the bigger bust. I found that this top drew in my waist really well whilst enhancing the shape of my chest. 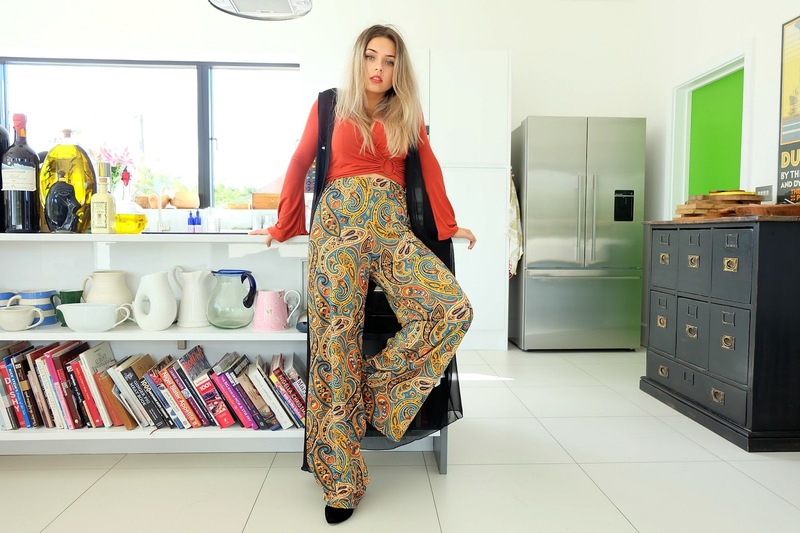 I'm only 5ft2 (and a half) so I find rocking flares can be an absolute nightmare. These flares aren't actually made for petites- so if I didn't have my heeled boots on I'd be pretty screwed. I got through to the second stage of the Cosmo blog awards!! I'm in the top 10 shortlisted blogs for the Fashion category which is pretty crazy! Please click here to vote for me to WIN - I'd appreciate it SO much!